Aldgate, central London, is fast becoming a hub for mixed-use developments, offering a booming retail sector and expanding residential areas. In preparation for the major redevelopment work in the Aldgate area, The City of London Corporation required a unique piece of technology, that would illustrate the planned major highways and infrastructure improvements within the Aldgate area. Areca Design was commissioned to provide an innovative Augmented Reality (AR) App, to help bridge the gap between the building site and the expectations of what would be in place, once the £14m redevelopment operation had been completed over the course of two years. 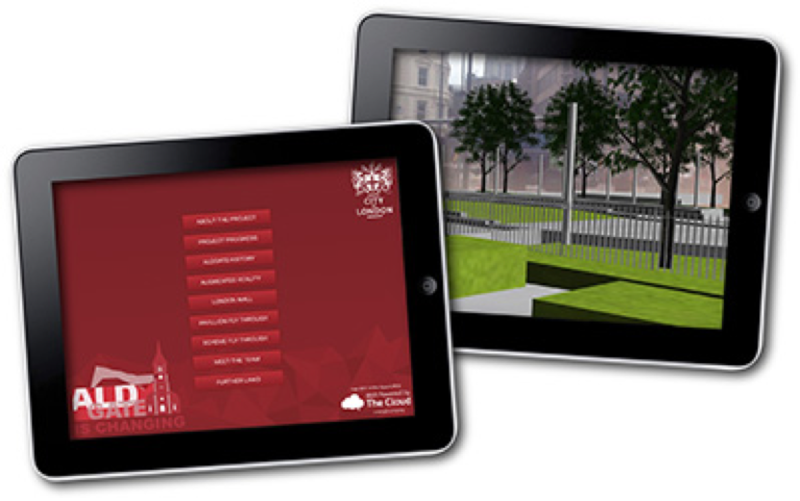 The aim of the AR Mobile App was to develop a way that locals and tourists could envisage what was going to be in Aldgate, after the renovation work was finished, in an educational and interactive way. The main innovation was for creative team to create a bespoke 3D model of the finished landscape, including trees, pedestrian areas and a new pagoda/cafe, using a new Mobile Augmented Reality App. We provided the ability for users to appear to be stood inside of the 3D model of Aldgate, when they were actually standing in-situ with the Aldgate area itself. This means that, upon opening the app and scanning the area, users can actually see all of the existing buildings, augmented with how the new landscaping will look. The Aldgate is Changing App is free to download and is available for both iOS and Android devices – please search for Aldgate is Changing in the Apple Store or Google Play.